GARDENA — A month before the rioting at the Manzanar War Relocation Authority camp in 1942, there was an even larger blowup at the Poston (Colorado River) WRA camp. Minoru “Min” Tajii will share his experiences of participating in the Poston Strike, which shut down the entire camp for about 10 days. The program will take place on Saturday, Nov. 22, from 2 to 4 p.m. at the Gardena Valley Japanese Cultural Institute and is being co-sponsored by the GVJCI and the UCLA Asian American Studies Center’s (AASC) Eji Suyama Endowment, which strives to preserve the history of Japanese American dissent during World War II. Tajii will be joined by his son, Richard, who will reflect upon his father’s protest and how it has influenced his life; and Lane Hirabayashi, professor of Asian American studies and the George and Sakaye Aratani Professor of the Japanese American Incarceration, Redress and Community at UCLA. Tajii was among the hundreds of Poston inmates who surrounded the camp jail to prevent two popular men from being tried in an outside Arizona courtroom for allegedly beating another inmate. Similar to what occurred at Manzanar, it was widely thought that the two inmates could not receive a fair trial outside of camp. However, the ensuing protest, successfully led by the Issei, was not just about the two arrested men but a manifestation of all the long-standing injustices that the Japanese American inmates had to endure since their evictions from their West Coast homes. A portion of the program will also be devoted to the Suyama Endowment. Prof. David K. Yoo, director of the Asian American Studies Center and Department, will discuss how the endowment seeks to preserve the experiences of the 100th/442nd Regimental Combat Team draftees, Army and draft resisters, no-nos, renunciants, conscientious objectors and other Nikkei dissidents of World War II. Samples of documents and artifacts donated by generous Nikkei dissidents will be shared. In addition, Tam Nguyen, AASC information technology coordinator and Suyama project co-coordinator with Martha Nakagawa will give a demonstration of the website that was created to enhance access to this collection. 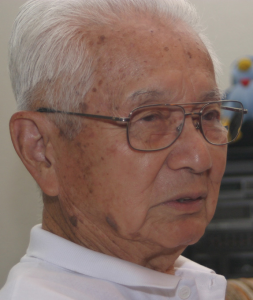 The endowment is named after Eji Suyama (1920-2009), a 442nd RCT soldier who was one of the few to survive the fierce battle to rescue the Texas “Lost Battalion” from behind enemy lines during World War II. Come hear this first-person account of a little-known part of World War II history and learn how you can help preserve the history of the dissidents. For more information or to RSVP, contact UCLA’s Asian American Studies Center at (310) 825-2974.